July 3304 saw an astonishing amount of fearmongering and scapegoating that was brought up by a few people feeling threatened by a religious minority. These reports were further fueled by the Galactic media jumping on the scapegoat train by picking up on what otherwise would have been a local minor issue. Instead, it was blown fully out of proportions by alluding to wild speculations and unaccountable theorycrafting about a Thargoid fifth column secretly infiltrating our civilisation. In the already heated-up debate, whether communicating with the Thargoids is still possible or whether a fully armed conflict is inevitable, this was the most irresponsible thing to do. In this fog of ever subservient media spin and baseless fearmongering, the Children of Raxxla (CoR) have chosen to build a lighthouse to serve as a beacon for security, welfare and the caring for one another. Picking up on the ideas of former Federation president Jasmina Halsey to commit to easing the pain of those who are often forgotten first in a war, the Children decided to support the Empyrean Foundation of Yum Kamcabi in their attempts to regain their megaship, the Harmony, and to help those who had their governments throw them on the frontlines, and who were forsaken in remote warzones. The Harmony was originally commissioned in 3303 by Halsey and her supporters to provide shelter and security, but was lost to them amidst political turmoil and agitation that followed after. On July 9th, the first wave of CoR ships entered the system of Yum Kamcabi, and after having consulted with the Foundation’s executive officers, agreed to run a number of campaign data errands to spread the word among the neighboring systems. A few other ships arrived, and they were mainly occupied with coordinating workforces and aid workers getting ready for the job. After this initial preparation, the campaign was ready to be launched in full scale. Consequently, news of these events quickly surged throughout the system itself and supporters began to rally to the Foundation’s cause. It seemed people had only forgotten what the Harmony once stood for, temporarily blinded or put into a slumber by media spin and the ever power hungry political entities. On July 15th, however, the Children's first actions were rewarded. After enough political pressure had been built up on the local factions, the Yum Kamcabi Progressive Party stepped forward and in a token of sincerity unanimously offered the Empyrean Foundation the use of their expansive security facilities of King Terminal. Plans were quickly put into place to convert a number of storage facilities and staff quarters for commodity storage and refugee reception. In another agreement, the Progressives proposed the use of their local communications hub as a news bulletin for broadcasts to and from conflict areas. This forthcoming token caused a storm of support by other local factions and the Foundation’s reputation surged throughout the system. It was only one day later that the otherwise tranquil system of Yum Kamcabi saw a long line of supercruise signatures travel inward towards the otherwise equally tranquil station of Dirichlet Orbital. Flight Comm hadn’t seen such large numbers of traffic since February 3303, when Halsey had issued her statement to build a refugee center. However, this time it turned out that a number of free traders had spread the word about the Empyrean Foundation wanting to restore their refugee program and were asking for transportation capacity and goods delivery. There was even talk about the Yum Kamcabi Purple Life Industry, one of Halsey’s major donors, backing the effort with their funds. With this prospect, the Foundation found themselves in a boom state in no time. 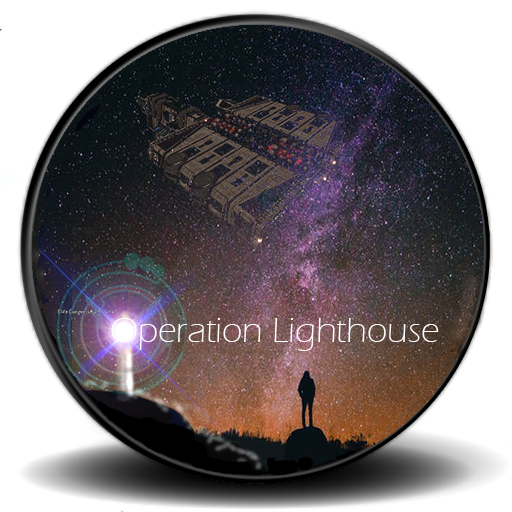 On July 23rd, another group entered Operation Lighthouse, taking sides with the Foundation in their attempts to regain their assets: In a hastily set up campaign meeting with the Foundation execs and the CoR Consulate, the Dark Echo group of the nearby Disci system agreed to send a number of their transportation ships and refitted passenger liners to aid the Foundation in handling the number of aid workers and extra commodities the sudden boom state had earned them. A few days later, Foundation executive officials finally found themselves confident enough. Members of the Children of Raxxla had guarded their refugee convoys safely through the neighboring systems, while the Foundation had committed every single ship they still had in order to make a final push. Dark Echo and the Children had run all kinds of data errands to facilitate the Foundation’s communications campaign and had also discouraged a number of apparent covert counter-operations and sabotage attempts. These had been secretly conducted by the GCRV 62586 Union Party (G6UP) from a black ops ground facility on an icy moon. The facility was subsequently dismantled by an armed Foundation squad. This was enough and now was the time to make the bid: On July 30th the Empyrean Foundation filed a vote of no-confidence against the G6UP and called upon paragraph 87b of the Independent Systems Concordant, resulting in an emergency (aka 'coup') election to redistribute system assets. The bidding was supported by the Children of Raxxla and the Dark Echo group of the Pilots Federation, who provided ample proof of the Union Party’s sabotage actions against the refugee program and other wrongdoings. On August 2nd, after a tumultuous 3-days approbation period and the examination of the proofs of sabotage, the Yum Kamcabi General Assembly declared the Foundation’s bidding justified and ordered the G6UP to hand over control and administration of their primary asset, Dirichlet Orbital, to the Empyrean Foundation. Facing massive opposition in the General Assembly the G6UP agreed to these terms and immediately began to negotiate their assets’ repurposing. It all went so fast in the end that the Empyrean Foundation had to nominate a number of vacant executive and administration positions, but in the end, everything remained orderly and peaceful. A good prospect, for much of the real work would now only begin, with new refugees and aid workers arriving each day, and with a lot of commodity donations having to be distributed among them. In an unforeseen, brilliant move of defiance, the G6UP openly declared they would under no circumstances support these rallys for violence in good conscience. Instead, they decided to dedicate their whole support to Halsey’s Foundation from now on, to show the galactic community the importance of working together across the political aisles to secure a home and a future for the victims of this outright evil propaganda. This move was all the more astounding, as the G6UP had been a well established party of the Alliance for decades, whereas the Empyrean Foundation was more or less seen as an independent, somewhat esoteric newcomer without any real political affiliations. In turn, not all members of the G6UP followed their party leadership’s orders immediately, and a number of counter operations in the Yum Kamcabi system and its neighbours had to be discouraged by the Children of Raxxla and other groups. The culmination of the conflict was a coup by the admin officers of the Foundation’s megaship “The Harmony” that replaced the rogue G6UP cell that still controlled the ship. While ships from the Children of Raxxla were blocking the landing pads of the megaship, the coup was seen through peacefully and resulted in the arrest of said rogue cell. On September 21st, after nearly three months of constant campaigning, the “Harmony” was finally handed over to their original owners, the Empyrean Foundation, and thus Jasmina Halsey’s noble refugee program. With the Harmony back in the fold, and having also control over Yum Kamcabi’s vital space station of Dirichlet Orbital, the groundworks for Halsey’s continuing efforts to ease the pain of those who have to flee from the conflicts the Powers lay upon them were laid out. It would be a lighthouse for those in need once more. It was a day to ...remember! In this universe there are only three conditions for you: You are either part of the solution, part of the problem or part of the landscape. This system is accompanied by only two choices: You accept it or you change it.